A key figure behind the Baltimore protests is planning an even larger rally Saturday, according to The Baltimore Sun. Malik Z. Shabazz, a Washington-based lawyer who helped spearhead demonstrations over the death of Freddie Gray in police custody, announced Tuesday that Saturday’s “massive national rally” would address “the burn behind the burn.” The news comes after initially peaceful protests ended in violence that spread from the weekend into early this week. Gray, a 25-year-old black man, was arrested April 12 and died of a spinal cord injury on April 19. Protestors have denounced Gray’s death, leveling criticisms at police tactics after a series of well-publicized lethal encounters between unarmed black men and law enforcers. This Saturday’s turnout, as predicted by Shabazz, is substantially more than the 1,200 individuals who marched through Baltimore last Saturday. At that stage, Shabazz told NPR, “It cannot be business as usual with that man's spine broken, with his back broken, with no justice on the scene.” And it certainly wasn’t business as usual. On Monday, following Gray’s funeral, The New York Times reported that protests devolved into rioting, arson and looting. Fifteen police officers were injured in the turmoil, and the city enlisted the National Guard and imposed a curfew to regain control. Yet, as Rachel Shabi writes for Al Jazeera, the media’s outrage at the outbreaks of violence has distracted attention away from the single instance of violence at the core of the story: the death of Freddie Gray. “You are suggesting broken windows are worse than broken spines,” Baltimore community organizer Deray McKesson told CNN host Wolf Blitzer following Monday’s turbulent protests. Reports on incidents of looting and arson have obscured the fact that the majority of the Baltimore protestors remain peaceful, and that many good people are going out of their way to make sure the situation doesn’t deteriorate. Police Commissioner Anthony Batts has said that a police report into Gray’s death will be filed with state investigators Friday, but the Baltimore police announced that the internal report will not be made public. Earlier in April, six officers were suspended after Gray’s death, although the initial police report recorded that Gray had been detained “without force or incident.” The Gray family attorney claims that the deceased’s neck was “80% severed” and his voice box was almost crushed. The report will remain under wraps, according to Police Captain Eric Kowalczyk, to preserve the “integrity” of the investigation. It is not known when the results from a separate investigation conducted by the State’s Attorney’s Office will be made public. It remains to be seen whether frustrations over the investigation’s current opacity, added to the city’s ongoing tensions, will push upcoming protests once again into violence. “The rally we conducted here was very disciplined and very civilized. We are not responsible for whatever happened after that,” Shabazz has said in defense of last Saturday’s march. The Baltimore Sun points out, however, that both the U.S. Commission on Civil Rights and the Anti-Defamation League consider the New Black Panthers — Shabazz's old organization, which he left in 2013 — a hate group. Reverend Alvin S. Gwynn, Jr., president of the Interdenominational Ministerial Alliance of Baltimore, expressed unease over the involvement of outsiders like Shabazz in continued protest. Such activists “aren’t trying to solve the problem. They're trying to use this situation to gain a platform for their own agendas,” Gwynn told the Sun. Baltimore’s uniformed security forces have roughly doubled in size since the chaotic protests came to a head Monday, with 2,000 National Guard troops deployed alongside 1,000 additional officers sent by police departments in Maryland, New Jersey and Pennsylvania. 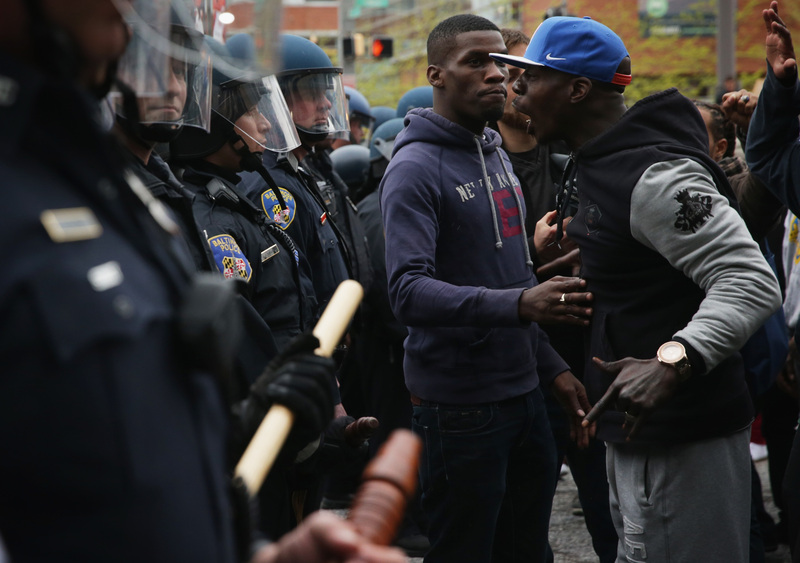 Baltimore Police Department itself boasts 3,000 officers. “This combined force will not tolerate violence or looting,” Governor Larry Hogan said Wednesday.